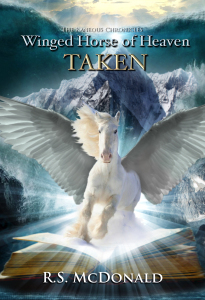 Winged Horse of Heaven: Taken is the third book of The Raneous Chronicles and continues the adventures of Raneous, the beloved winged horse of heaven and his friends in a snowy winter tale. An urgent message of Roslyn’s mysterious kidnapping sends Raneous and Brian rushing to the city of Livia in the dead of winter. They have only one clue, found in only one place — the town of Talla high in the Jovan Mountains, fiercely defended by skilled warriors. Why would Tallans kidnap Roslyn — or anyone for that matter? Heavily supplied for the cold journey, Raneous, Brian, Lord Myran and Rhyse head into the frozen north in search of answers, but dark forces are at work. They soon find that Roslyn is not all that the enemy has taken!